Description: By using compliant design expertise and methods, FlexSys was able to design a single-piece wiper arm and blade that costs less and both outlasts and outperforms traditional metal assemblies. A composite thermoplastic of 30%-glass-filled PBT was determined to have the required properties and characteristics to meet the demands and provide the necessary strength/stiffness ratio. The single-piece moulded design eliminates 11 parts along with the associated assembly, weighs half as much, and costs only 1/3 as much as the legacy design. The single-piece moulded design eliminates 11 parts along with the associated assembly, weighs half as much, and costs only 1/3 as much as the legacy design. Unlike the traditional hinged blade, this wiper provides constant spring pressure to the blade through each of its arms. However, the difficulty in development was that current 3D modelling programs were not up to the task, as they design using rigid members and linkages. In compliant design, the elasticity of materials must be embraced and used to create motion. To surmount this obstacle, FlexSys is developing unique software called FlexWorks™, with the help of a grant from the National Science Foundation. This software allows the input of desired motions and magnitudes, and will run through thousands of iterations to find one to most closely fit the given criteria. It considers the maximum stress/strain capability of the material in each iteration so as not to exceed it. The output provides the required thickness variation throughout each bending member. It will also show the new compliant mechanism in motion, bending, and displaying a stress analysis. The final design can be changed in the edit mode and re-evaluated, then saved in a file to 3D print or import to Solidworks, Ansys, etc. FlexSys believes the software could eventually become a module available in 3D modelling programs. The first ever public view and alpha release of the software will be available in the JEC Atlanta demo zone. The advancement of composite injection moulding materials will fuel the future of compliant structures. Additives such as carbon fibres and nanotechnologies can increase the strength/flexibility ratio, allowing for higher load applications with greater fatigue-free travel. More compliant design concepts can be seen in the demo zone, including applications in the automotive, medical, robotics and prosthetics fields. "The American market has traditionally been pioneer in the composites industry both in terms of manufacturing and innovation. The US is a strategic geography for the global composites market as it represents around a third of its value” said Mrs. Frédérique Mutel, JEC Group President and CEO. “The JEC Innovation Awards Program reflects these observations that are also crossmatched by the variety of applications we received from America, Asia, Europe and even Oceania” Nicolas Baudry, JEC Americas Director adds. For this year’s award’s program, winners in categories such Design, Testing, Biocomposites, Aeronautics, Transportation, Automotive, E-Mobility, Process and Sports & Leisure will be celebrated. All exhibitors, visitors and journalists are welcome to attend the ceremony. 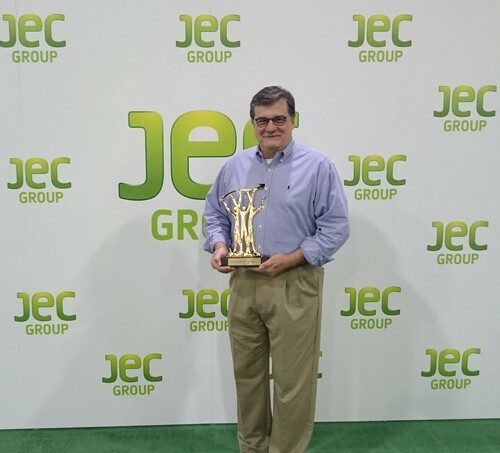 The JEC Innovation Awards Program is supported by JEC Composites Magazine and Aviation Week.